This is the final entry of our MBTI 5-part series. 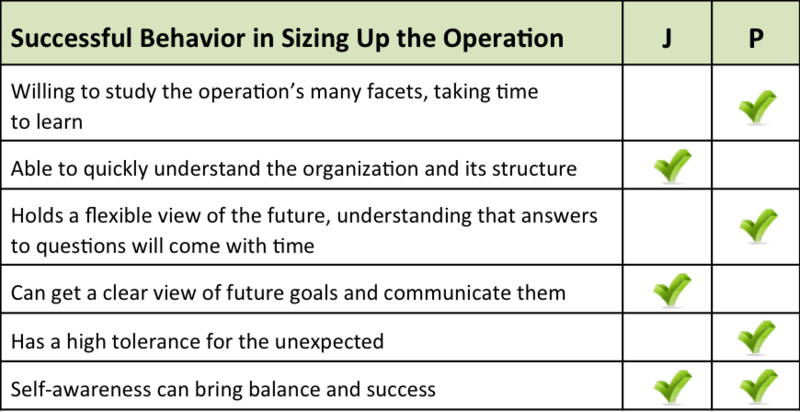 So far we have examined how preferences and behaviors associated with dimensions of Extraversion/Introversion, Sensor/Intuitor, and Thinker/Feeler impact New Leader transitions. This month we will conclude with a discussion of how Judger/Perceiver behaviors can influence a New Leader’s onboarding experience, and how to manage the risks associated with each approach. The Judger/Perceiver dimension is about how one relates to time – ranging from planning to goal execution. This is an important dimension to consider because every organization (and workgroup) has different cultural norms about timeliness, planning and execution. Judgers tend to be proactive about planning, and build structure around their deliverables to ensure their work is delivered in a timely and orderly fashion. They are also more likely to arrive at meetings early (or on time). Perceivers are inclined to leave their options open, not becoming too locked into one path to an outcome; and they are better able to adapt to unexpected circumstances. New Leaders stepping into (or advancing up to) a new role usually start sizing up their new organization during the interview process (see E vs. I blog). Judgers and Perceivers may require different lengths of time to understand the operation, and they will likely react in different ways to what they observe. When studying an organization’s operations, Judgers might not allow enough ramp-up/learning time. They will likely generate an understanding of their new situation rather quickly. As a New Leader, the Judger often wants to know precisely how things run and what the future holds. They may believe that questions need immediate answers, and will seek fast access to related details. Even before they take the helm, Judgers are often setting goals and defining the steps they will take to meet their objectives. Perceivers are not as likely to pigeonhole any particular situation or person. They will probably devote more time learning about the many facets of their new operation, and not jump to conclusions. For Perceivers, the future is open. If they cannot understand every aspect of the operation right away, they believe that answers to their questions will come, with time. While many Perceivers may take 2-3 months to size up the organization, in contrast, some Judgers might think they need only 1-2 weeks (if that). Once they understand their new operation, New Leaders are in a position to take action -- why else would they be there? 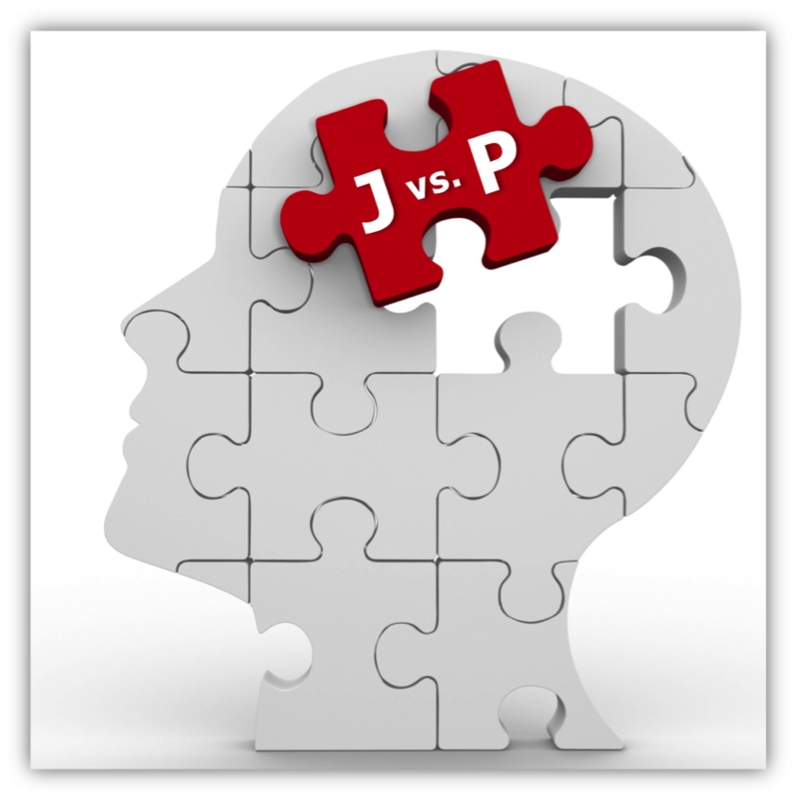 Managing daily performance will likely differ between Judgers and Perceivers. Judgers have an urgency to gain closure and may quickly jump into the fray. They might generate a strategy and have goals in place even before their nameplate is ordered. Judgers tend to find comfort in creating order, defining steps, and holding themselves and others accountable in follow-through. You won’t catch Judgers or their teams racing to meet a deadline. They are decisive, deliberate, and if they anticipate any potential changes they will plan accordingly. Conversely, when unexpected changes occur, Judgers might struggle to adjust, and could be viewed as not having considered enough possibilities before taking action. Perceivers are more likely to cast a broad net in their aspirations for the operation – to see what is possible. They enjoy the freedom to carve their own path and “go with the flow,” and may create a work environment that fosters this approach. Those with this preference tend to take risks by “thinking outside the box,” which can be essential to the organization’s success. Perceivers are comfortable in more ambiguous settings where ample time allows them to consider their next step, and they can adapt to changes without much concern. But this can negatively impact the team’s ability to deliver in a timely way (and frustrate those who prefer a structured, well-communicated approach). Both Judgers and Perceivers are an asset to any organization. The key for both types of New Leaders is to understand what the organization values, apply strengths and have strategies for overcoming challenges. Anticipate that in every kind of role, curve balls will be thrown at you and your operation. Recognize that structure and planning are important, but too much of both can stifle progress. Give others in your organization time to catch up to you, and respect their need for freedom to think creatively and respond flexibly. Realize that becoming agile will require some letting go of the original plan. Know that goals will need to be set, and deadlines must be met. Realize that those around you will require clarity on your direction. Read the signals -- if work is piling up, it is time to approach your work differently. Demonstrate accountability for yourself and others. We hope you have enjoyed this 5-part series on the MBTI dimensions. Understanding your preferences and how those relate to your onboarding experience can smooth your entry into a new role and work environment. 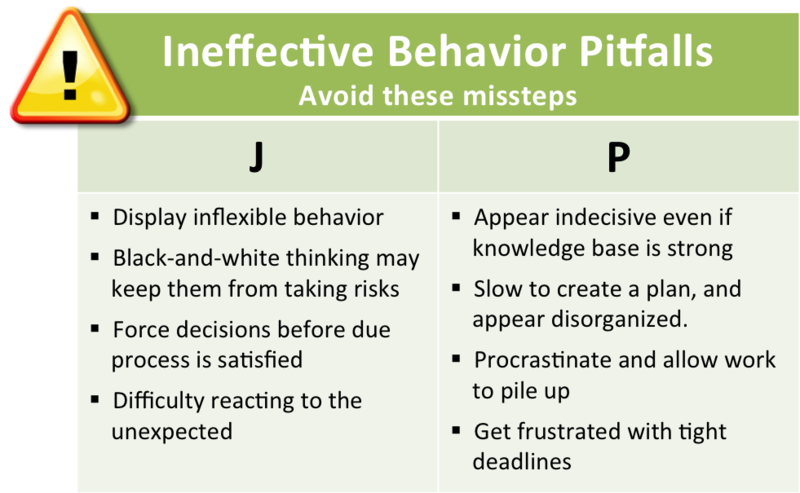 If you have any questions about how your MBTI preferences can impact your effectiveness as a New Leader, contact us at info@leaderonboarding.com or visit our website: www.leaderonboarding.com.